No, your eyes do not deceive you – this is indeed another review for Martin McDonagh’s Three Billboards Outside Ebbing, Missouri on this website, after I uploaded a review of it last October, when it premiered as the Closing Film Gala at the BFI London Film Festival (which, incidentally, you can read right here). The main reason I’m taking another look at this movie, other than the fact that it’s still a pretty damn solid flick, is to see if there are any bits I neglected to talk about before that deserve to be discussed in an analytical review for it, not to mention if it still holds up a good few months after first seeing in a more exclusive setting. That last part feels somewhat redundant, because not only is this still as great as it was back in October, but like many other great movies there are things to be picked up in a second viewing that would have so easily gone over my head the first time around. Luckily, there are also some new things to talk about with this movie, which thankfully don’t make this second review entirely pointless. As before, the plot revolves around Mildred Hayes (Frances McDormand), a woman whose teenage daughter was brutally raped and murdered seven months prior, but the lack of progress by her local police department in solving the case and finding the perpetrator has made her increasingly frustrated and bitter. 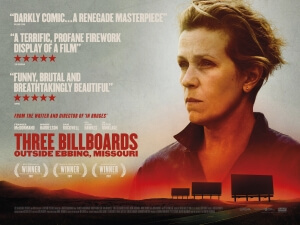 She decides to rent out three abandoned billboards just outside of town and display a message on them which calls out Sheriff Willoughby (Woody Harrelson) for his apparent negligence with this case, but in doing so incurs the anger of several townsfolk who are more sympathetic with the cancer-stricken Willoughby than they are of Mildred, including the racist and incompetent Officer Dixon (Sam Rockwell) who is one of many people who takes this situation far too much to heart. One of the many things I picked up on during this second viewing is how pretty much every single person in this movie is in some way struggling with their own severe insecurities and overwhelming flaws, all of which are exacerbated by Mildred’s billboards. Outside of Mildred, who has the most reason to feel broken due to the loss of her daughter and the guilt of which she carries as a chain everywhere she goes, Willoughby is overcome by his impending sense of doom due to his pancreatic cancer and the fact that he is leaving this world without any sense of complete closure, including with this murder case. As soon as the billboards debut, he is under new pressure to reopen the case even though it seems all but impossible to solve, but his declining health is warping his own sense of better judgement and triggers a questionable decision that has major consequences on the rest of the film, all down to a simple plea from a grieving mother asking him and his police force to get a move on. Likewise, Dixon starts the movie out as a complete bully, inflicting police brutality on those he doesn’t like – who mostly happen to be people of colour – and just being an absent-minded buffoon of a cop who would rather sit at his desk reading comics than go out and solve an actual murder. However, as the film goes on, he slowly unravels and reveals himself to be a man just as tortured as Mildred is, someone who could have taken a lighter path in life but allowed his extreme antagonism to get the better of him and turn him into the person we first see him as. Of the three leads, it is Dixon who arguably has the largest arc and biggest change to his character, from being just this seething bully to someone who’s a lot more human than we ever gave him credit for. McDonagh’s writing is so on point here, and the performances by everyone are so phenomenally done – especially McDormand and Rockwell who here give some of the finest performances of their career – that these heavily flawed characters are allowed to be fleshed out properly and be given time to develop over time without it feeling at all rushed. This is ultimately a movie about some truly damaged people coming together in the wake of an unorthodox event spurred by tragedy, all of them coming to grips with their own faults, insecurities and imperfections if they are to even begin to consider forgiving themselves for who they have ended up being. During the first viewing of this movie, I was already wowed by how layered McDonagh had written his characters and how compelling he had made each and every one of their arcs, but a second go has made me see how much deeper he had really dug into all of these people and how, through his understated direction and again some truly wonderful performances, he has really managed to find the humanity in some of the darkest places these characters end up going. It is heartbreakingly poignant and at times darkly funny, but never gets off track with its tone and remains consistently wonderful all throughout, not to mention challenging and delightfully mature about its very grim subject matter. Not only is it easily McDonagh’s grandest film to date, but it also represents a new side of a filmmaker who after making In Bruges could so easily have stuck to what he knows, but with Three Billboards Outside Ebbing, Missouri proves that he can use his pitch-black view of the world to do something new while also feeling like something only he could have made. It’s a fantastic movie, and I’m a little ashamed it only took me two viewings to fully appreciate how fantastic it is. Three Billboards Outside Ebbing, Missouri is still as wonderfully written, directed and acted as it was when I first reviewed it back in October, but a second viewing really shows how deeply layered and masterfully written a film it really is.